When external auditors are observe organization’s internal system as requirements of international standards, auditors are note down requirements to follows the standards manuals and its procedures, work instructions etc.. In line with international standards requirements, incase of the non compliance found that auditors are consider as non conformity. N.C (non Conformity) is the non compliance to requirements of international standards like ISO 9001, TS 16949, OHSAS 18001 etc.. For those standards clauses are need to accurately compliance. All the Non conformity need to properly closed to comply in timely, when requirements of clause of internal standard is comply then auditor close that Non conformity, for the non conformity compliance need to proper structured document to compliance can possible to returned that is external audit compliance report. 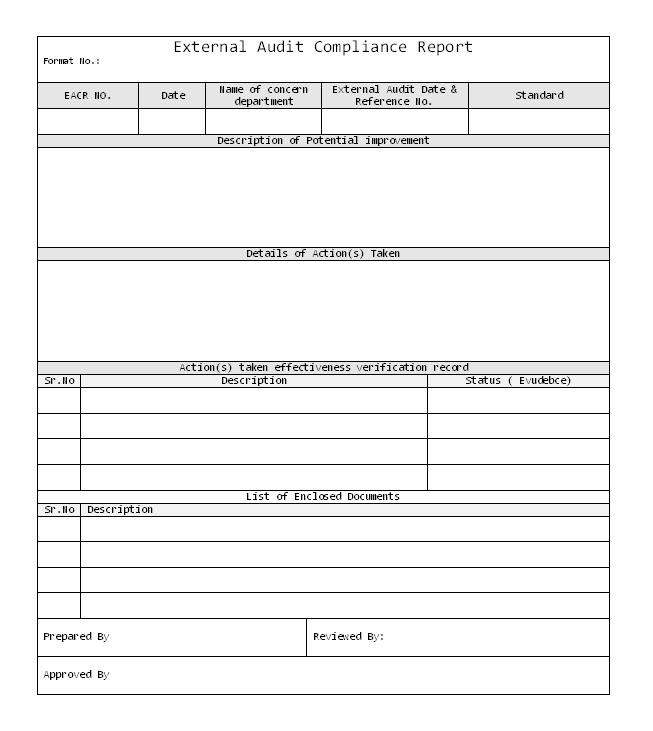 External Audit Compliance report are prepare with reference to external audit non conformity given by auditors respective numbers of non conformity, in the format are mentioned of description of potential improvement and action reporting for the particular non conformity found.